Rapidly connecting the world's applications, data, and devices, MuleSoft, a well recognized and the top-line provider of integration platform for SaaS and Enterprise Applications, has gained over 210,000 developers and support of many leading cloud providers with its game changing strategies. In the journey of fulfilling the demands of enterprise integration needs for a better future, we had formed a consulting partnership with Mulesoft to elevate customer results towards Integration and API Management Space. Our partnership with MuleSoft promises to provide you with cutting-edge solutions for the most challenging connectivity problems across SOA, SaaS and APIs in a developer friendly way. We are empowered to utilize the leading iPaaS platform to deliver flexible solutions that will help you simplify your business architecture while making it fully agile and cost optimized. Mulesoft's Anypoint Platform lets companies realize business transformation through API-led connectivity, and allows you to integrate your apps, data and devices on the cloud and on-prem. Using an industry leading iPaaS platform from Mulesoft, Miracle can provide flexible solutions that will help you simplify your overall architecture by removing point-to-point integrations and application silos to obtain business agility and thereby reduce IT costs. 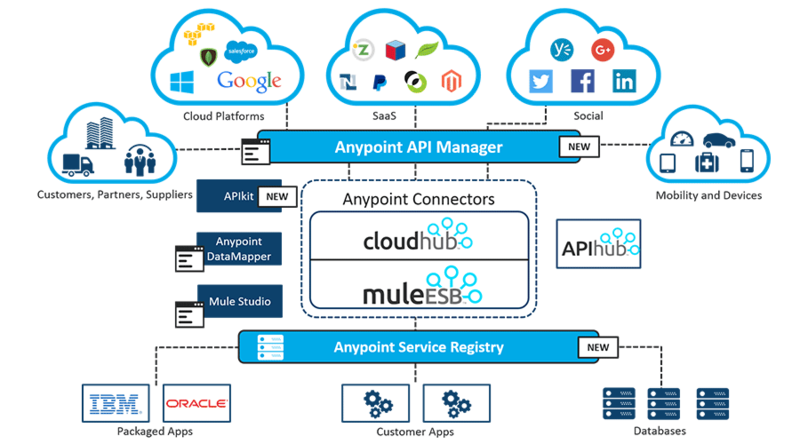 MuleSoft's Anypoint Platform™ is the world’s leading integration platform for SOA, SaaS, and APIs. MuleSoft provides exceptional business agility to companies by connecting applications, data, and devices, both on-premises and in the cloud with an API-led approach. By leveraging Anypoint Platform, companies can re-architect their SOA infrastructure from legacy systems, proprietary platforms, and custom integration code to create business agility. They can migrate technology infrastructure to the public or private cloud and prioritize adoption of SaaS applications and other cloud technologies. Using an industry leading iPaaS platform from Mulesoft, Miracle’s team of experts with their out-of-box solutions will help customers simplify their overall architecture by removing point-to-point integrations, Silo applications to obtain business agility, build connectors for API's whether it be a SOAP or a RESTful web service with an amazing quality, innovation, and reliability at much reduced IT costs. With all the offerings that we do along with Mulesoft, here are some of the advantages of being our customer. Are you looking to build microservices, enabling your organization for cloud integration and consolidating your integration platform for digital scale? Contact us at soa@miraclesoft.com today to start your Mulesoft journey with Miracle.